(Bloomberg Businessweek) -- The Brexit disaster has stained the reputation of direct democracy. The United Kingdom’s trauma began in 2016, when then-Prime Minister David Cameron miscalculated that he could strengthen Britain’s attachment to the European Union by calling a referendum on it. The Leave campaign made unkeepable promises about Brexit’s benefits. Voters spent little time studying the facts because there was a vanishingly small chance that any given vote would make the difference by breaking a tie. Leave won—and Google searches for “What is the EU” spiked after the polls closed. Done right, deliberative democracy brings out the best in citizens. “My experience shows that some of the most polarising issues can be tackled in this manner,” Louise Caldwell, an Irish assembly member, wrote in a column for the Guardian in January. India’s village assemblies, which involve all the adults in local decision-making, are a form of deliberative democracy on a grand scale. A March article in the journal Science says that “evidence from places such as Colombia, Belgium, Northern Ireland, and Bosnia shows that properly structured deliberation can promote recognition, understanding, and learning.” Even French President Emmanuel Macron has used it, convening a three-month “great debate” to solicit the public’s views on some of the issues raised by the sometimes-violent Yellow Vest movement. On April 8, Prime Minister Edouard Philippe presented one key finding: The French have “zero tolerance” for new taxes. Another way to fix democracy is to change how people vote. Rather than have voters register a simple yes or no for a candidate, there’s growing interest in ranked choice voting, which allows them to express their full range of preferences. 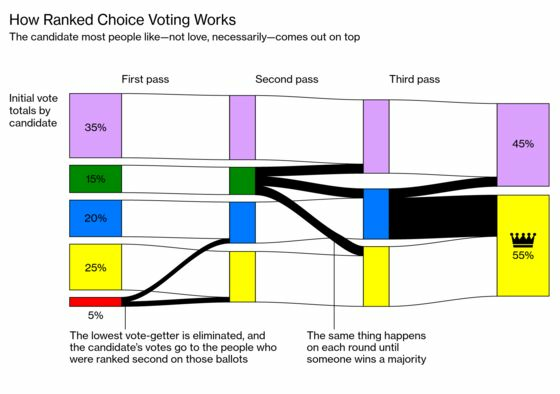 Voters rank everyone on the ballot, and if no one wins a majority of first-place votes, the candidate who got the fewest is dropped from consideration and his or her votes are redistributed to the other candidates based on voters’ second choices. This winnowing process is repeated until someone wins a majority. The U.S. Constitution’s framers tried to insulate government from mob rule by having senators elected by state legislatures and the president by members of an electoral college, who weren’t originally required to echo their states’ voters. Democracy gradually became more direct, with a surge in the early 20th century, when the Progressive movement brought women’s suffrage, direct election of senators, and a wave of state laws providing for referendums, ballot initiatives, and the like. What the American system needs now is a third stage of development, journalist Nathan Gardels and investor Nicolas Berggruen argue in Renovating Democracy: Governing in the Age of Globalization and Digital Capitalism, a book coming out on April 30. In 2010 they founded the Think Long Committee, a bipartisan group working toward improving governance in California. In 2014, then-Governor Jerry Brown signed a Think Long-backed measure requiring public hearings on ballot initiatives. The new process led to a first-in-the-nation digital privacy act last year.